You’ll need a Cuisinart for this, although it can be made in a mortar and pestle. 1. Roast the tomatoes ahead of time in a 400 degree oven for about an hour with olive oil and salt. 2. Rinse basil thoroughly and let dry. I leave it out for a while after going outside and shaking it. It will dry by itself. Give yourself plenty of time here. You can catch up on some reading while the basil dries. Stem basil. 3. Have all ingredients ready and place walnuts, garlic, and some the basil in Cuisineart. 4. Place your pasta of choice in lightly salted boiling water. 5. To the pesto, add olive oil and continue to add basil until all is added. I like a thicker consistency, but make it to your desired consistency. 7. 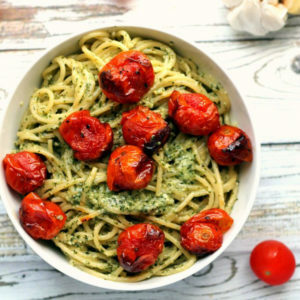 Mix the tomatoes and pesto to the pasta. Start sparingly and make sure that you saved a bit of the pasta water and add to the cooked pasta with the pesto. Just use a few tablespoons. Add salt to taste. 7. If storing the pesto for later use, place in a bowl and make sure to put a small layer of olive oil on top to keep the pesto from oxidizing/or freeze in ice cube trays. The combination of the pesto and roasted tomatoes was delicious! – Summer squash cut into medium thick coins. 1. Slice the squash crosswise 1 inch thick; scrape out any seeds. 3. 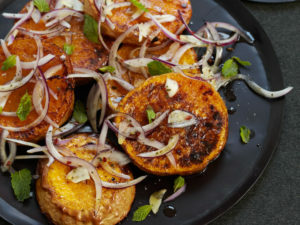 Slice onions length-wise and sprinkle over squash. 4. Drizzle generously with olive oil. 4. Bake for about 25 minutes, or until just tender. 5. Add chopped oregano and mint and let stand for 10 minutes.